We’d love your help. Let us know what’s wrong with this preview of Alien Blue by DeAnna Knippling. Bill Trout didn’t set out to get involved with aliens. He just wanted to run his damned brewery and heal up from being abandoned by his ex-wife. But that ain’t the way things worked out, and now he has some bodies to bury, an alien kid who’s wanted for murder—mass murder—to hide, and a planet to save. But Bill won't go down easy. Fortunately, the aliens, who are a blue ooz Bill Trout didn’t set out to get involved with aliens. He just wanted to run his damned brewery and heal up from being abandoned by his ex-wife. But that ain’t the way things worked out, and now he has some bodies to bury, an alien kid who’s wanted for murder—mass murder—to hide, and a planet to save. But Bill won't go down easy. Fortunately, the aliens, who are a blue ooze that takes over your body and are real hard to kill, have no tolerance for alcohol. 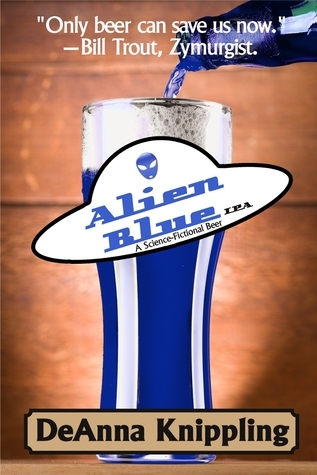 So now Bill has a new beer on tap: Alien Blue. He just has to be careful who he serves it to. To ask other readers questions about Alien Blue, please sign up. “Alien Blue” by DeAnna Knippling is a rather complex Science Fiction story that tries to incorporate elements of humour in a manner reminiscent of Douglas Adams. The plot itself followed the arrival in a small New Mexico town of an alien (inside a human surrogate) called Anam. His arrival unveils a potential conspiracy by his fellow aliens who are trying to convert all of mankind into their surrogates. When bar owner Bill Trout is pushed into hiding Anam from his fellow aliens, he soon finds him “Alien Blue” by DeAnna Knippling is a rather complex Science Fiction story that tries to incorporate elements of humour in a manner reminiscent of Douglas Adams. The plot itself followed the arrival in a small New Mexico town of an alien (inside a human surrogate) called Anam. His arrival unveils a potential conspiracy by his fellow aliens who are trying to convert all of mankind into their surrogates. When bar owner Bill Trout is pushed into hiding Anam from his fellow aliens, he soon finds himself at the centre of a storm in which he is unsure on who is now alien controlled and who isn’t. To be honest I went into this book with high hopes, it sounded interesting and I have enjoyed many other humour-centric science-fiction novels. However, it just felt flat to me and I didn’t actually find much in the story to make me laugh and overall it was actually a rather dark story at times. That isn’t to say the plot itself isn’t intriguing or creative because besides the rather generic invasion of the body-snatchers premise there were some rather interesting elements to the story and a very complex and twisting plot. The use of the blue beer that is alluded to in the title is also something I hadn’t seen before and was completely different to what I was expecting which was a pleasant surprise. Unfortunately there are various issues with the plot beyond the lack of humour, the first of which is that it appears to start mid-story. As I read the initial chapters it basically felt like I was reading a sequel with references and comments that didn’t make much sense to me. For example, I still don’t understand how Bill Trout seemed to just quickly reach a conclusion that Anam was an alien due to some clicking noises. There was no reference or reasoning from what I had read up to that point to explain why someone would think of aliens. Another issue is the rather large amount of characters that the reader is subjected to, all of which seem to be referred to in different manners as the story progresses. Sometimes it is by their surnames and the next it will be by their forename. This just led to me getting slightly confused at times as this big ensemble cast and complex, twisting plot line were hard to keep on top of. It just meant that the various deaths, alien control elements and other attempts at dramatic moments didn’t really wow me as I had spent too much effort trying to understand what was actually happening. Finally, the ending itself was a disappointment to me as it just left to many open ends and didn’t really conclude anything of importance. With all the effort I had put in to try and follow the plot I was not happy to see that I didn't get any proper reward. Alien Blue by DeAnna Knippling is a complex little gem of a story. There are so many plot twists that occur and keep occuring straight through to the end of the book. You read on in wonderment, What will happen next? Briefly, (on the surface), Alien Blue is a story about aliens coming to Earth and going to a small town in New Mexico (near Roswell). These aliens came thousands of years ago and tried to harvest humans -- unsuccessfully. Another alien was sent but this one, somehow, had Mankind's best interests at heart -- but by his actions it was difficult to discern his true intentions. The story mainly takes place in and around a bar in the town of Haley, New Mexico. The town's top brass are all trying to stop the little blue aliens from putting all of Mankind under the alien's dominion and making "meat puppets" out of them. But, how do you do so without knowing, for sure, who is alien-infected and who is not? This is where the plot twists and the red herrings rear their heads making this a page-turning read. Ultimately, this story is about how we as humans savor and embrace who we are as individuals. Without this understanding, the human race is easily broken apart and conquered. A very long opus, Alien Blue makes you think and question: What would we do if coerced to do things against our beliefs by a hostile third party? While there are noticeable typos and grammatical errors in the book, the story is so intricate and well-plotted that you can disregard them and still digest and enjoy the overall work. The premise for this book certainly is unique. It is not a serious, ‘aliens are going to take over the world’, kind of science fiction – there were times I was reminded of Terry Pratchett or Douglas Adams as various quirky characters made an appearance. In a nutshell, yes, the aliens are here to take over the world, but don’t fret – a good beer and/or shot of vodka might be the solution. If you’re looking for a well-defined hero, plan of action or some human-alien fighting you might be disappointed, but that doesn’t mean you shouldn’t give it a try. I liked the strange dynamics between characters such as Bill, Miss Dewey/Mel, Anam, Mimi, Jack, Bart and Dinah. I liked the idea that an alien could live amongst a small town for months without anyone realising, and that in a ‘body-snatchers‘ kinda way that you couldn’t quite always tell who was infected or who’d be next. Alien Blue is definitely a different story than I am used to reading. I read very little sci-fi and this one has all the makings of science fiction. I did laugh quite a bit in the beginning. Bill, the owner of the bar, had quite a few good one liners. In the beginning. However, as the story progressed he didn't seem as funny any more. There were quite a few characters to keep track of. I found it difficult to keep Mel and Mimi straight. They were completely different (Mimi was a teenager and Mel Alien Blue is definitely a different story than I am used to reading. I read very little sci-fi and this one has all the makings of science fiction. I did laugh quite a bit in the beginning. Bill, the owner of the bar, had quite a few good one liners. In the beginning. However, as the story progressed he didn't seem as funny any more. There were quite a few characters to keep track of. I found it difficult to keep Mel and Mimi straight. They were completely different (Mimi was a teenager and Mel was a secretary) but for me their lines blurred a lot. And once disaster strikes I found it even more troublesome keeping everyone straight. I do enjoy some sci fi stories and movies. I favor the likes of H.G. Wells in the sci fi department. This one is completely different from the genre that I like. I found it hard to follow and there were way too many characters. Sometimes their last name is used and then later their first name. This made it confusing. I can honestly say I will not be getting the follow up book on this one. Although I did like the premise of the blue alien beer. Very creative. An Alien Invasion story of a different color. Blue to be specific. Definitely the first story I've ever read that ultimately becomes about with Blue Beer. If you're interested in something a little different regarding Alien Invasions, this one might be for you. The first half (at least) of the book is very good. The last half... Yikes. It was like a different author picked up the book and decided to turn it into something else. Completely lost me. Sci-fi comedy is really hard to pull off. This one didn't work for me: nothing wrong with it, just wasn't to my taste. DeAnna Knippling is a freelance writer, editor, and designer living in Colorado Springs, Colorado, USA. She has published short stories in numerous publications, including Black Static, Big Pulp, Crossed Genres, Penumbra, and more. She runs her own micropress at http://www.WonderlandPress.com.